False Creek Fuels can supply larger vessels and ships either from our wharf in False Creek (to vessels up to ~165′ in length), or via truck to your location. False Creek Fuels can supply larger vessels and ships either from our wharf in False Creek (to vessels up to ~165′ in length), or via truck to your location. 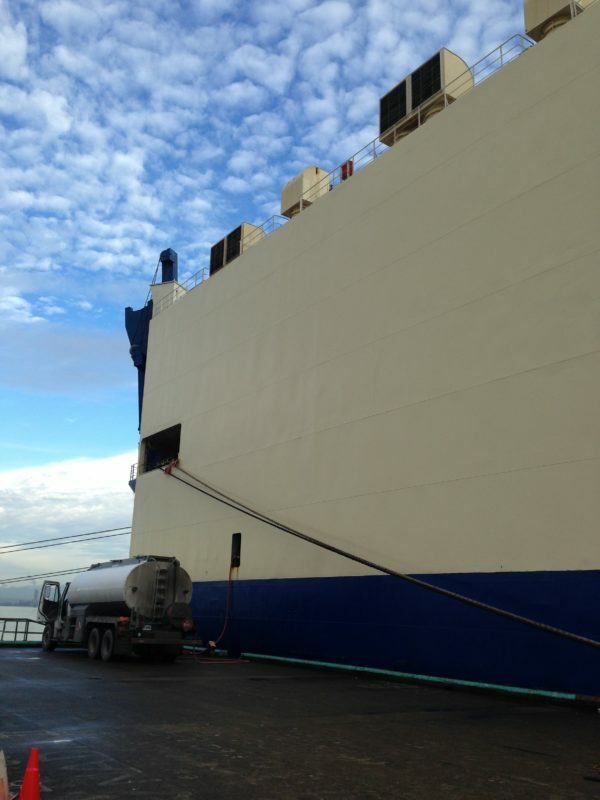 We supply vessels with B5 Marine Diesel with a 60º Flash point. We can sell directly to the vessel owner, or we are happy to deal with your fuel broker/agent. For all high-volume fuel inquiries and quotations, call us for a very competitive quote at 604-638-0209 or email fillup@falsecreekfuels.com. We are fully equipped to deliver any quantity of fuel to you! 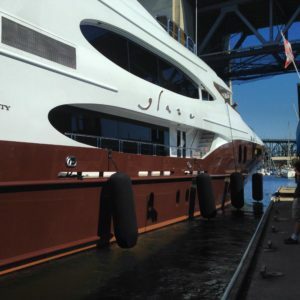 From superyachts to tugs and fishing vessels and everything in between, False Creek Fuels delivers! IMO numbered vessels can count on us to supply fuels that are MARPOL compliant. We will supply all of the appropriate/compliant paperwork along with sealed fuel samples. In addition, we are able to supply Ships’ Stores to qualifying commercial vessels with outbound papers. You will be greeted on arrival with our professional team to handle your lines, and look after any requests you may have. Quite simply, False Creek Fuels is the place to stop in Vancouver for marine fuels & lubricants! Can accommodate vessels up to 165′. Fuels delivered at 200+/- lpm. State of the art pump control allows for standard pumping speeds or activation of a boost pump for high-flow needs. Fuels are filtered prior to delivery. All camlock and fuel fittings are available. Unlimited volumes can be delivered with prior arrangements. Shell Rotella Lubricants available by the case, pail, or bulk using our high speed oil dispenser. Available 24/7 with advance notice. Our trucks can deliver to suitable locations around Vancouver and the Greater Vancouver area. All camlock and imperial fittings (including flange) available (advance notice required for metric). Multiple trucks ensure expedited fueling. Fully equipped spill responder accompanies all deliveries ensuring ultimate safety. Safety is our number one goal – we follow strict guidelines to ensure people and the environment are protected at all times.